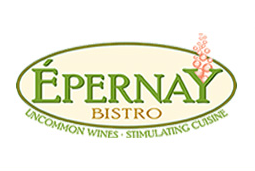 Friday night my husband and I went to Epernay Bistro in Bridgeport for dinner and were pleasantly surprised. It’s located in the downtown area amidst a few other restaurants and bars. Their website states that they have an organic menu so we were interested to see if their claim held true. The atmosphere is one of a quaint little wine bar complete with a mellow live guitarist sitting up front. On the cocktail menu there were several drinks with organic Crop vodka, which I had never heard of, but thought was interesting. We shared appetizers of Pate de Campagne (a coarse country style with dijon mustard & cornichon) and a potato leek soup which was one of the evenings specials. Both were outstanding. For an entrée B****** had the bratwurst with mashed potatoes and I had the duck confit (crispy slow-cooked duck leg served with sweet and sour braised red cabbage and fingerling potatoes). It was all quite delicious and just as good later that night when we reheated the leftovers. When we had ordered I asked the waitress if the duck was organic or not. She said she didn’t think so, but went back to ask the chef. She returned moments later, delightfully explaining that it was, in fact, organic. After our meal the chef came out from the kitchen and my husband asked him where exactly he purchased my duck from. His response was a farm in upstate New York. I have to admit I think it’s strange that I felt weird about asking the staff where my food came from, but when I think about it it’s not weird at all. I mean, don’t I have the right to know what I’m eating? I suppose I’ve settled in to a routine in my past 30 years of existence just accepting whatever I was given to eat as real food. Now I know better. I encourage you all to inquire about the menu the next time you dine out. Let me know how it goes! Entry filed under: Restaurants. Tags: Bridgeport, Connecticut, Epernay, Organic. Thanks for coming in to our little establishment and taking the time to write about it! You’re welcome! We thought everything was really delicious and will definitely be back! Glad to find a great place to eat right here in Bridgeport.